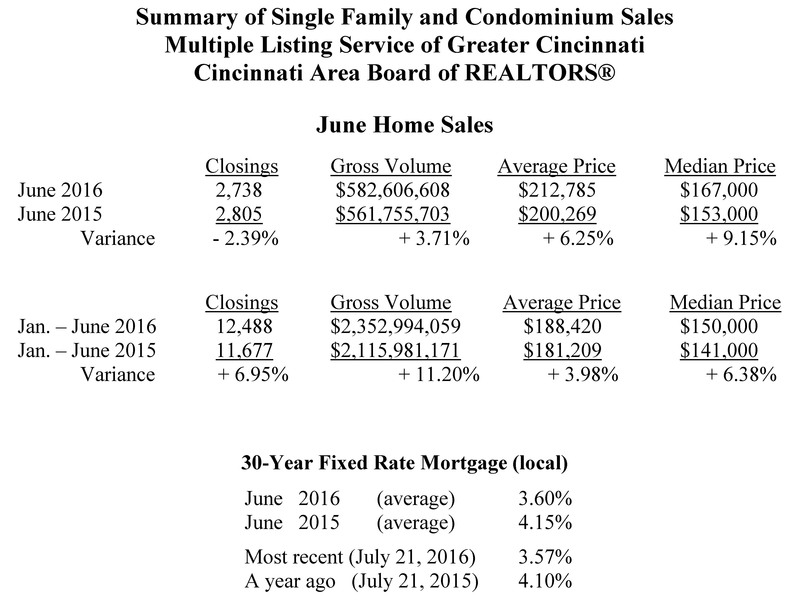 Greater Cincinnati home sales this month were strong, yet down – 2.4 % compared to a very strong June a year ago. June home sales were 2,738 compared to 2,805 in June 2015. For the first half of 2016, home sales are up almost 7.0% over the first half of 2015. “For the first half of 2016, home sales continued their upward momentum,” said Patti Stehlin, President of the Cincinnati Area Board of REALTORS®. “Greater Cincinnati is very affordable for everyone wishing to purchase a home, but you need a real estate professional, a Realtor, to get you through the process of today’s market,” said Stehlin. The average home price jumped to $212,785 compared to $200,269 a year earlier, a + 6.25 % increase. At the same time, the inventory of homes for sale, as of June 30, continued its year-over-year declining trend to 6,896 from 8,807 a year ago, down – 21.7%. “Our current inventory of homes for sale will remain low until new construction increases and consumers wishing to sell not wait to put their home on the market until they find their new home. Remember, if a home is priced right and is in move-in ready condition, properties are selling quickly,” said Stehlin. Local home mortgage rates in June averaged 3.60% for a 30-year fixed rate loan. The rates were higher at 4.15% a year ago. At these fixed rates, the monthly principal and interest payment on a $100,000 home loan with no money down would be approximately $455. “Today, more than ever, a consumer needs to contact a REALTOR to help guide them through all the important details involved in buying and selling a home. A REALTOR will assist you through the entire process, and is your absolute best source for professional and accurate information,” said Stehlin. Nationwide, June home sales were up + 1.1% from May on a seasonally adjusted basis, and were up + 3.0 % from June 2015.